One of the stories least reported has been the one about Haitians organising for themselves, particularly stories presented within a framework of feminist organising and movement building. This is one woman’s story of how she, her family and the people in the various communities in which she works, came together collectively to care for each other’s needs and how that struggle has become the foundation of a new movement of the poor for change in education and the material lives of women and men – a struggle for dignity. Their personal and collective humanitarian response was completely off the radar of NGOs, international institutions and the Haitian government. Even Save The Children, whose office is located right next to the school did nothing to help SOPUDEP. However ultimately this was an aside for Rea. What was important was that those who needed help of whatever kind, received it and beyond that the struggle for dignity and self-determination for the poor people of Haiti. A mere five minutes passed between the death of one one of the school teachers and the life given to Rea and her teenage daughter – on of three children. Once it was established Rea’s family were all safe – a house just five minutes walk from Rea’s own home collapsed – she set about caring for the many in her community and where ever she was needed. Everyone was in shock but there was no time to think about what had happened as people were injured. Many people – students, families knowing about her community work, flocked to Rea’s home and at one point there were some 60 people in her home. People feared to sleep indoors so they removed all the mattresses, blankets, pillows, whatever they could find and spread them outside. It was January and freezing cold during the night but anything was preferable to being inside. Rea said it took her months before she stopped waking up with nightmares of being crushed. Even now one wakes up and gives thanks that you made it through the night. I too find myself staring at the ceiling every night and wondering which part would collapse first and how I would get out. The first day after the quake, Rea went to the shop were she usually bought the school supplies and asked if they would give her credit as she needed to buy food. They told her to take whatever she needed and not to worry. As much food as possible was collected and everyone in the house, the children, students, guests neighbours, set about making food packs. They worked all night making the packs which they then distributed to anyone on the streets during the day. As donations from friends of SOPUDEP and organisations such as the Haiti Emergency Relief Fund (HERF), the Haiti Action Committee, Sawatzky Family Foundation (SFF) began to arrive, Rea was able to buy more food and medical supplies and continue the distribution. Food which was only being given to women and mostly bags of rice were available for those prepared to queue for up to 4 hours. Rea said she did not have the time to queue for 25lbs of rice and preferred to go and buy it with whatever money she had to hand. Besides, fights often broke out with people tired and hungry and everyone trying to push their way forward. The military would then beat the women and children. In total food and water were distributed to 31 centers by Rea’s team. In addition to financial donations, SOPUDEP received a lot of medical supplies which were taken to the various mobile clinics which had been set up in camps and other locations. Though the number of recipients decreased over time, the food collection and distribution last for three months. At a point in time Rea realised this dependency created out of a crisis could not continue. They would forever be in a state of oppression and remain in the clutches of NGOs, beggars in their own land. No one ever knew when money would arrive which meant any kind of systematic planning was impossible. It was like waiting for the tooth fairy to arrive and besides what humanitarian aid was being distributed was not reaching Rea’s community. It was all too ad hoc to be sustainable. The next money she received was a sum of $3000 and she began to think of another way. Instead of buying food but she would deposit the money in the bank and start a small micro-credit-saving programme. It took courage and was a huge risk because people were hungry but determined to create some degree of sustainability and stability, in a moment she made up her mind. A meeting was called and the idea put to the 21 women with whom she had been working over the past months and though there were doubts they trusted Rea. The Micro-Credit scheme “Fanm SOPUDEP AN AKSYON” [SOPUDEP Women in Action] begun with $3000 and 21 women. I was surprised when I heard Rea had started a Micro-Credit scheme as there were so many negative reports on schemes which rather than enhance and empower women, ended up impoverishing them even more. So I was interested to find out more about the SOPUDEP scheme, whether it was working and why it worked and I will write about this later after meeting with the various women’s group. Rea’s philosophy is that each individual has to take responsibility for themselves and the notion of something for free is neither healthy nor sustainable. Both the school and the women’s project are framed within the idea of personal and collective responsibility. Education in Haiti must be available for all and everyone encouraged to attend and no one is turned away from SOPUDEP because they cannot pay. However everyone is asked to try to contribute something when they can, even if it is 5 gouds or helping in the school somehow [$1=40Gds appx]. The school operates two sessions – the main one in the morning and an afternoon session for those who have never attended schools both older children and adults. The elections are a distraction. Leaders have the power to bring change but no one believes any leader will do anything for the poor. Everyone I asked about Aristide wanted him back because they believed he was one leader who could change their lives for the better. Right now the only way is for communities to reach out to each other and create alliances which is what SOPUDEP is beginning to do. Rea’s vision is one I share. We cannot fix Haiti, but we can fix our community and help others fix theirs. Eventually as all these communities build alliances amongst themselves, they will become strong and then maybe begin to fix Haiti. Since the earthquake there has been an increase in the awarness that communities have to help each other and work together. People are not only more determined to improve their lives and that of their community, they truly believe it is possible. Two more schools for the poor have come under the umbrella of SOPUDEP. One in Bobin with 250 students, children and adults and one in Boucan Lapli with about 60 children. 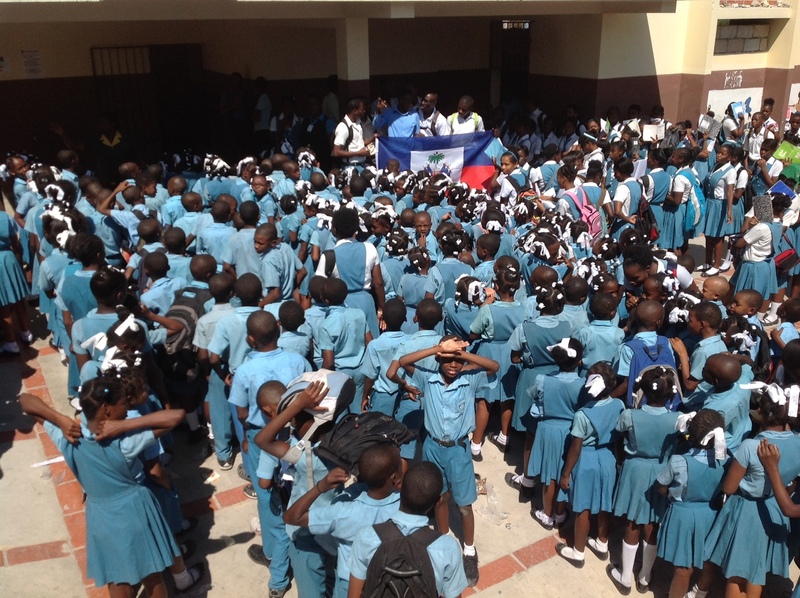 The main school which started in 2002 with 182 children from Petion-Ville presently has 486 students. I have spent two days at the school with the freedom to roam. I came across a class whose teacher was absent and I ended up teaching English for 45 minutes followed by the students giving me a lesson in Kreyol. Now I have been asked by them to teach the same class for the next couple of weeks till they break uap for holidays. The school is truly like family. Since the Micro-credit scheme, parents and school staff have all been encouraged to open savings account. The children are continuously greeting and kissing Madam Rea. Her office which she shares with the accountant / office manager, Billy Bataille, is a constant hive of activity with women coming to deposit their repayments, students wanting things fixed or asking advice from Madam Rea or Billy. Outside the office, women clean beans and rice in preparation for tomorrow’s food – the door is always open. Yesterday Rea opened a suitcase of books she had bought with donations from a partner school in the US. She now has some 15,000 books [mostly in French so more Kreyol and English books are needed] which have to be indexed and will form the school library. A volunteer teacher from the US has promised to take on the task. SOPUDEP nevertheless faces many challenges. The building survived the earthquake but remains in disrepair. All the external walls of the compound collapsed along with most of the surrounding buildings with the exception of the Save The Children building. The building housing the school dates back to the Duvallier days and was always structurally superior to others in the neighbourhood. All the classrooms are open to the elments as there are no windows. There is no water and since the earthquake, no electricity. Recenly a group of NGOs met to discuss how to control the spread of cholera within the country’s 22,000 schools. The idea is to hold training sessions for district heads and some school directors on precautions to take. Many schools are already doing this but a more coordinated effort would improve the situation. However as Rea pointed out, we can do all we can in the schools but what happens when the children return to their homes where they are reliant on standpipes and no santitary facilities? The majority of people are unemployed yet there is masses of rubbish and rubble to clear – the solution seems quite simple really. Through donations, SOPUDEP has purchased a piece of land in Delmas 83 and have so far managed to build the fencing wall. It will take six months to build but all that depends on how quick they can raise the money needed to complete the project. I find it sad that an organisation like SOPUDEP which is real and which has a history has to rely on small donations from international friends and parents to survive. If they are not deserving of more sustained support then I wonder who is. Sokari Ekine writes and organizes at Black Looks. This post appeared originally here.